Congratulations to the student members of the L.E.A.P. team of the University of Illinois at Urbana-Champaign for winning APA's inaugural Smart Cities Student Design Competition. The L.E.A.P. student team from the University of Illinois at Urbana-Champaign win APA's inaugural Smart Cities Student Design Competition. 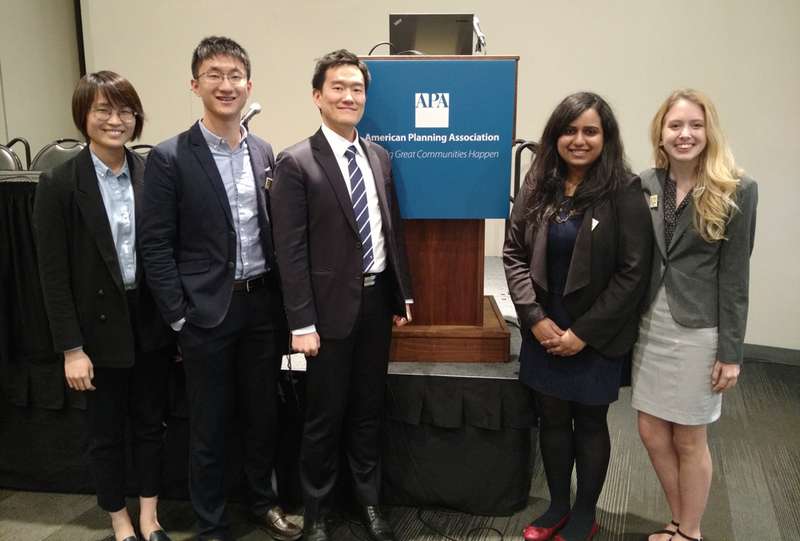 (Left to right): Dijia Chen, Gavin Wong, Junghwan Kim, Richa Singh, and Amanda Wolfe. Photo by Matt Bucchin, AICP. As part of continued outreach and engagement efforts stemming from APA' Smart Cities and Sustainability Initiative, APA's Division Council and Student Representatives Council (SRC) partnered together to offer the inaugural Smart Cities Student Design Competition. Student teams from across the country competed against each other for the opportunity to learn about how Smart City technologies are changing our communities and to win a $1,000 prize. The intent of the competition was to introduce and engage students early to the Smart City discussion. The design of the competition encouraged student planners to work on interdisciplinary teams with other students from our allied professions (e.g., architects, landscape architects, engineers, etc.). Teams were asked to come up with both public and private Smart City solutions for a proposed vacant block in the Chelsea area of New York City. As a means to encourage them to think beyond the project boundary, the site was further connected to the greater Lower Manhattan area via a NYC transit bus stop, the Hudson River Greenway, and High Line project. For the inaugural competition, 11 student teams representing colleges and universities from all regions of the country submitted a poster and a report detailing their placed-based Smart City solutions. 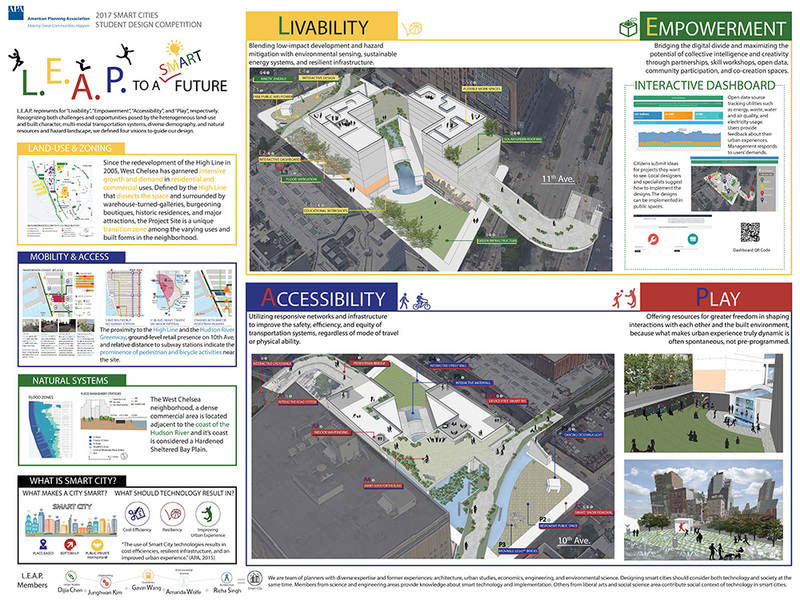 An independent jury of planning professionals evaluated each team on their creativity and quantity of Smart City ideas; quality of research, writing, and document preparation; quality of their physical design; and approach to team collaboration. In addition, each team was given the option of submitting optional content or material. At the National Planning Conference, representatives from each finalist team presented an overview of their design, discussed their collaboration and approach to the project, and otherwise presented their case as to why their design deserved to be the winner. Not surprisingly, each and every student did an incredible job conveying their ideas in both a creative and articulate manner — making it very difficult for the jury to determine the winner. After careful evaluation and discussion, the jury awarded the L.E.A.P. student team from the University of Illinois at Urbana-Champaign as the inaugural winner of APA's Smart Cities Student Design Competition. The team creatively identified a four-part vision — L.E.A.P. to a Smart Future — detailing how Smart City technologies could be used to improve Livability, Empowerment, Accessibility, and Play on site. The L.E.A.P. team's presentation poster. Initial feedback from students, APA staff and leaders indicate that the design competition was a successful first effort. As such, plans are already underway to prepare for a second design competition in association with APA's 2018 NPC in New Orleans. Stay tuned for additional information about the process and design competition topic. A special thanks to our jury and committee members who worked hard in organizing the competition and evaluating the student teams. This includes Rob Kerns, AICP, Division Council representative; Ellen Forthofer, SRC representative; William Anderson, FAICP, APA past president; Vatsal Bhatt, Technology Division representative; Janae Futrell, AICP, representing municipal planners; and Matt Bucchin, AICP, Smart Cities & Sustainability Task Force representative. Top image: A close-up view of part of the L.E.A.P team's poster presentation. Matt Bucchin, AICP, is the director of planning for Halff Associates, Inc., a regional interdisciplinary planning, landscape architecture, and engineering consulting firm based out of Austin, Texas. He has spent the past five years volunteering for the Sustainable Communities Division (and the division's precursor interest group) and other APA initiatives, including his project management role with APA's Smart Cities & Sustainability Initiative.